Representative Dave Griffith, a Republican, represents Cole County (District 60) in the Missouri House of Representatives. He was elected to his first two-year term in November 2018. Prior to his legislative duties, Griffith served as the executive director of the American Red Cross for six years. Griffith also served on the city council for Jefferson City. Prior to that, he spent 23 years working for KRCG TV in a variety of roles ranging from production to account executive. Griffith served in the U.S. Army 8th Special Forces Group as a Green Beret. Griffith is a member of the Kiwanis Club, Rotary International, American Heart Association, American Cancer Society, Easter Seals Association, Red Cross Board of Directors and the Special Olympics. He has been recognized with the Red Cross Heart of a Hero Award and an American Cancer Society Lifetime Achievement Award. Griffith is a graduate of Missouri Southern State University. 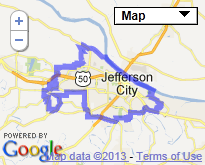 Griffith resides in Jefferson City with his wife, Leigh. They have two children and five grandchildren.